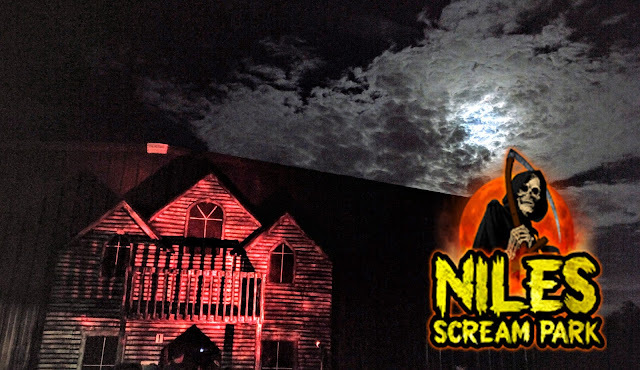 The 2015 haunt season is officially here! And we kicked off our year with Indianapolis' newest haunted house -- House of Trepidation! We were invited to a special invite-only soft-opening and we were made aware that they were working with a limited staff (they're official open date is 9/25, we visited on 9/24). And as is what's becoming the the norm, House of Trepidation offers not one, not two, but three attractions! We started off with the namesake attraction, the "house" of Dr. Belle, who is the running theme throughout the whole haunt. Immediately upon entering, your eyes snap directly to a marvelous faux staircase -- and it really sets the scene for what's to come. The decorations and set-up throughout this attraction is excellent, especially for a first-year haunt. It's incredibly obvious that a ton of work and effort hast been poured into this place. And the acting, for a haunt, was top-notch. We thoroughly enjoyed the actor interaction. And that includes a parlor trick being pulled on me when we first got there. Don't ask -- ha-ha. Next up was the Crossroads of Carnage, which I overheard being called "Clinic" a few times. Maybe I'm insane and hearing things -- who knows. Maybe I belong to Dr. Belle! But make no mistake, Crossroads holds up to the standard that was set previously by House. Set up like a clinic, you walk the halls and enter the various rooms where unspeakable madness is ensuing. And again, the actor interaction is A-1. If I had one complaint, it'd be the overuse of dark hallways. But you can't really consider that a complaint because it's an intentional angle they took. It works wonderfully, just not for me. The third and final attraction is Purgatory. This is the result of all of Dr. Belle's work. Where the dead walk among us mortals. I can't speak high enough on the quality of workmanship that has went into each room and hall. You will believe what you are seeing. And that's the whole point, right? And once more, the actors were great this time around, too. It's a rare treat to get their A-game for the whole show. And we got it. And Purgatory was a great ending to the House of Trepidation. 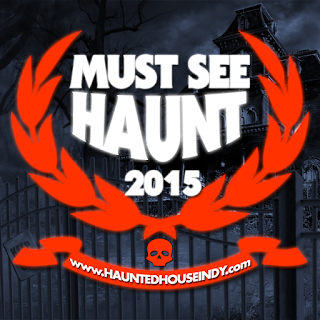 House of Trepidation is a certified Must See Haunt for 2015!